Esperanto is a constructed language, invented at the end of the 19th century by the Polish-Jewish ophthamologist L. L. Zamenhof. He believed that the division between the various ethnic groups in his city of Białystok could be overcome if they shared a language, and he published Unua Libro (First Book) describing the language he had been working on in 1887. The language originally grew in Eastern Europe and Russia, but spread to Western Europe and the first Universal Congress of Esperanto took place in France, in Boulogne-sur-Mer, in August 1905. Since then, a Universal Congress has taken place every year (except for during the World Wars), with the 100th again in France, taking place in Lille in 2015. Many other conferences, meetings, groups and organisations have since come about, some specifically for the promotion of Esperanto, and some merely using it as a culture-neutral working language. The language itself takes words from a range of European languages, including French, Italian, German and English, and its grammar is highly simplified and regular. It is possible to reach a working knowledge of the language in a fraction of the time it might take to learn a natural language like French or German, and new words can easily be invented and understood by use of the system of prefixes and suffixes with fixed meanings. We meet every Sunday from 1-3pm in the city of Southampton: the first Sunday of the month at Olaf's Tun in Woolston, and every other Sunday at the Art House Cafe on Above Bar Street. Add yourself to the Meetup group by clicking here for more information and to RSVP. Everyone is welcome, regardless of ability level. We do not normally have a set schedule for the meetings. We chat about what we have been doing in the week, discuss ideas for how to grow our group and Esperanto in general, and enjoy having some tea, coffee and cake. Everyone is welcome, regardless of ability level. We do not normally have a set schedule for the meetings. 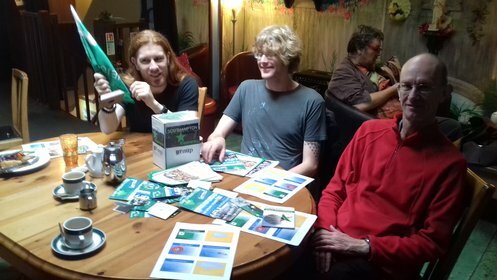 We chat about what we have been doing in the week, discuss ideas for how to grow our group and Esperanto in general, and enjoy having some tea, coffee and cake. Occasionally we have visitors from other nearby groups, such as the London club, or from further afield. There are lots of different ways to learn Esperanto. Over a million people worldwide have used Duolingo, a free website and app. A similar website, but dedicated to Esperanto, is Lernu!, which includes a free course, grammar reference, dictionary and forums to discuss with other learners. If you prefer to learn in person, the British Esperanto Association organises courses at Esperanto House, in Barlaston, Staffordshire, which are free to attend (though you will need to cover travel and accommodation expenses). Check their website here for details of upcoming courses, and information about the scheme to provide funding UK residents under 25 for travel and accommodation related to Esperanto events.